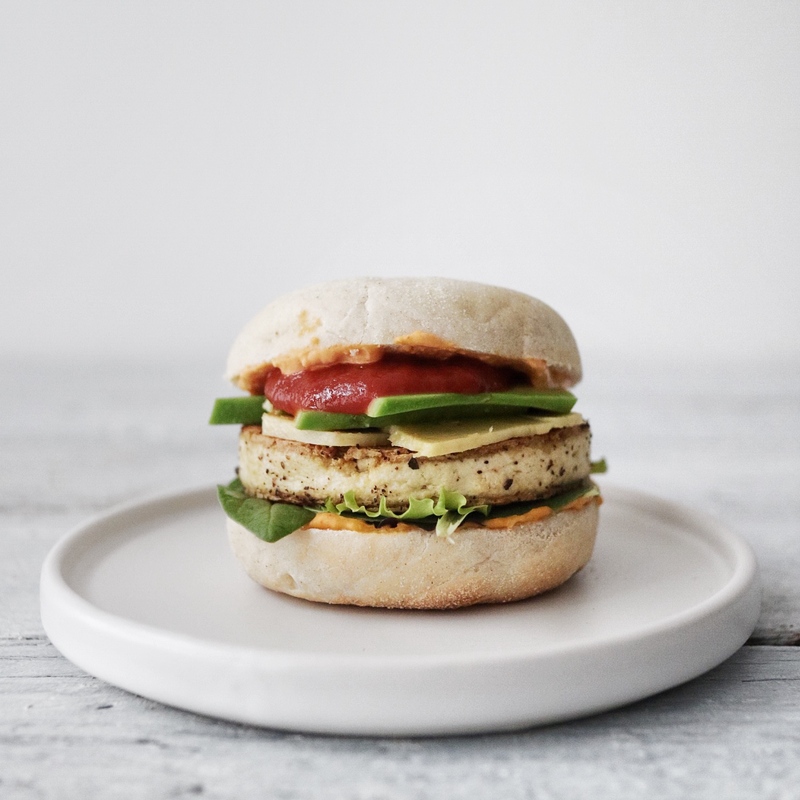 This Vegan McDonalds Egg McMuffin is the breakfast of all weekend breakfasts. Let’s be honest: vegan or not, most of us probably remember trips to McDonalds from or childhood. And let me tell you something amazing: making a vegan version of it, that’s also super tasty, is not magic & actually super easy! So let’s make the magic happen! Let’s start with the tofu! I used a pack of Cauldron Tofu in this case and I sliced the block in half lengthwise. Using a big round cookie cutter I cut a round slice of tofu of the same diameter as the English muffin. Add a splash of oil to a non-stick pan and sprinkle the Kala Namak into it. Let the salt dissolve a little in the oil, then add the slice of tofu to the pan once it’s sizzling hot. Fry the tofu slice on both sides until golden – make sure not to move it around to much. It can also help to press the slice into the pan with a ladle to make the edges nice and crispy! Season with a little pepper. Slice your muffin and lightly toast the slices, then spread the hummus on both of them. Let’s assemble! Add the spinach/salad to the bottom slice. Place the tofu on top, then let the vegan cheese & avocado follow. Add the tomato ketchup and then place the top half of the muffin on top. And voila! Have you ever re-created any vegan McDonalds dishes – or their vegan version? I’m kind of tempted to recreate a Vegan McDonalds Big Mac or the Fish-o-Filet that I remember from the nineties. Do they even still serve that last one nowadays? You can probably tell that I’ve gotten a little rusty when it comes to the McDonalds menu!